Soprano Christine Goerke, as Brünnhilde the Valkyrie warrior, at a dress rehearsal for Wagner's Die Walküre at New York's Metropolitan Opera. Christine Goerke is focused on endurance. The dramatic soprano is tackling one of the most challenging roles in opera: singing Brünnhilde, the Valkyrie maiden warrior, in Richard Wagner's epic, Der Ring des Nibelungen, at New York's Metropolitan Opera. Otherwise known as the Ring cycle, the 16-hour saga spans four operas and tells the story of gods, monsters, humans and an insatiable urge to own an all-powerful golden ring. "The thing is that there are three different roles within the Ring cycle for Brünnhilde and they are all very different," Goerke says. "The stamina is really the biggest issue, so pacing is paramount." It's not only Goerke's Met Brünnhilde debut — it's also the first time she's sung the roles back to back, as Wagner envisioned audiences to experience his cycle. Goerke wasn't always a huge-voiced Wagner singer. Nearly 16 years ago, the rising star was building her career on lighter fare by Mozart and Handel. Then she hit a wall. Her voice was maturing far faster then she had expected and she couldn't control it in the lighter music. "I literally thought I broke it," Goerke says. "But once I went in and changed my support and I allowed my voice the room to grow, it did what it was supposed to do and it turned out to be far less of a bump in the road than it seemed." But there were trying times. It took a few years for Goerke to reinvent herself, which meant less singing, fewer paychecks. "We went into quite a bit of credit card debt," Goerke admits. "We survived. We didn't lose our house, everybody was fed." She persisted, taking on some of the heavier Richard Strauss roles, catching breaks along the way with acclaimed performances as Chrysothemis in Elektra and as Dyer's Wife in Die Frau Ohne Schatten. "I just have the best job," Goerke says. "I get to be loud, pretend and dress up for a living. That's not so bad. I get to throw myself into a different world and be someone else for a few hours. It's a mirror image of the reason that we all go to the theater. We all want to escape the real world for a little bit; I just get to do it in a slightly different way than everyone else." Goerke explains that once you take away the gods, dragons, mermaids and giants from the Ring cycle, you're left with a web of intense interpersonal relationships at the heart of saga. "It's beautifully written," she says. "Anybody who thinks, 'Ugh, Wagner, I can't be in the middle of that for 16 hours' — if you can sit through a binge watch of Game of Thrones, I promise you this is much cooler." Goerke's performances run through May 11. Listen to the radio version for the full conversation between Goerke and NPR's Scott Simon. Some of the most thrilling and iconic music in opera - maiden warriors delivering battle heroes to their fortress in the sky in Richard Wagner's "Ride Of The Valkyries." SIMON: Of course the most famous Valkyrie of all - Bruennhilde. CHRISTINE GOERKE: (Singing) Hojotoho, hojotoho, heiaha, heiaha. SIMON: That's Christine Goerke, soprano, who makes her debut as Bruennhilde in the Metropolitan Opera production of Wagner's "Ring" cycle in New York City. She joins us from studios at the Met. Thanks so much for being with us. GOERKE: It's a pleasure. How are you? SIMON: Well, I'm fine. You're the one who's going to have to sing. Can - help us understand how demanding a role this is. GOERKE: The thing is is that there are three different roles within the "Ring" cycle for Bruennhilde, and they are all very different. The stamina is really the biggest issue, so pacing is paramount. And honestly, as you say, this is my debut singing the role here at the Metropolitan Opera. But it's also my debut singing the entire cycle in one go. I've sung all of the Bruennhilde roles before, but this is my first time doing all three of them consecutively. SIMON: And what's it mean to do this at the Met? GOERKE: Oh, everything. I mean, anytime I'm here, this is - I'm a Long Island girl. And I was in the Young Artist Program here for three years, and they took a chance on me. And they nursed me when I was fledgling and not even anywhere near this repertoire yet. But everyone here always believed in me, and so this will always be home for me. SIMON: What do you mean they took a chance on you? GOERKE: Well, I mean, one never really can know when you are dealing with a young dramatic voice. When I started, I was not singing Wagner. I was not singing Strauss. I was singing Mozart. I was singing Handel. People heard this dramatic sound even early on in my early 20s. And without the Young Artist Program here, I'm not really sure I would have gotten where I'm going. SIMON: I have been told you went through some trying times. GOERKE: I did. It was trying because, in fact, the last thing you want to do as a performer is show anyone anything less than your best. And going from singing these Mozart roles and these Handel roles with a lighter sound to these bigger dramatic roles, it's quite a big step. And I read about dramatic voices when I was younger. And I understood that probably in my late 30s, early 40s I would have to make a big switch and change my technique and the way I was singing and move into different repertoire. But it all started happening far earlier than I was expecting. I was about 32 or 33. And honestly, I just - I couldn't put two and two together that that's what was happening. I literally thought I broke it (laughter). GOERKE: Yeah. I mean, it sounded like a strange thing to feel. But once I went in and I changed my support and I allowed my voice the room to grow, it did what it was supposed to do. And it turned out to be far less of a bump in the road than it seemed - thank God. SIMON: But you had real practical concerns, too, about making a living at it. GOERKE: Well, I mean, of course. You know, I had just met my husband. We got married when my voice changed. I have two beautiful daughters, and I had just had them when this was going on. It was not an ideal time for this to happen. We went into quite a bit of credit card debt. Thank God they were there because we survived. We didn't lose our house. Everybody was fed. And thank God I'm still here. SIMON: ...See you onstage at the Met. GOERKE: They are. They're going to come to, hopefully, one of the performances of "Siegfried." They like the idea of a dragon. And they're going to go to the movie theater, so they're going to be watching the HD. And I was told if I don't give them a shoutout, they're going to disown me so (laughter). SIMON: Well, what are their names? Do a shoutout here. GOERKE: Their names are Maggie (ph) and Charlie (ph). They are just the lights of my life honestly. SIMON: Of course. Do you ever do the battle cry for them - just for grins? GOERKE: Oh, boy, have they heard it. They probably know it better than I do at this point. SIMON: This is - I - we can't get you to do it for us, right? GOERKE: Oh, no. No, no, no (laughter). I'm not warmed up enough to do that (laughter). SIMON: Yeah, yeah. I think we have a recording, which we're going to run now. GOERKE: (Singing) Hojotoho, hojotoho, heiaha, heiaha. SIMON: Ahh, I'm scared to death. SIMON: And you seem so nice otherwise. GOERKE: (Laughter) It just depends on the day, you know? I just have the best job. You know? I get to be loud, pretend and dress up for a living. That's not so bad. GOERKE: And then, you know, it's - I get to throw myself into a different world for a few hours and be someone else for a few hours. It's a mirror image of the reason that we all go to the theater. You know, we all want to escape the real world for a little bit. And I just get to do it in a slightly different way than everyone else. SIMON: I want to hear another excerpt, if we could. Let me set the scene imperfectly. We're nearing the end of "Die Walkuere," the second opera in the cycle. You're having an argument with your father, Wotan, king of the gods. GOERKE: (As Bruennhilde, singing in German). UNIDENTIFIED PERFORMER: (As Wotan, singing in German). GOERKE: When you take the gods and the dragons and the mermaids and the giants out of this, you have a father and a daughter and the father who can't see everything that his daughter can be and the daughter who thinks she knows better than everybody and is trying to do right but does everything wrong. It sounds simplistic. But in fact, the interpersonal relationships are at the heart of the "Ring" cycle. SIMON: You're not even singing, and I have tears rolling down my face. GOERKE: I just - it's beautifully written. And I mean, I encourage anybody who thinks, ugh, Wagner. I - you know, I can't be in the middle of that for 16 hours. If you can sit through a binge watch of "Game Of Thrones," I promise you this is much cooler (laughter). SIMON: Do your daughters know what you do for a living? SIMON: I mean, they know you're an opera singer. But do they know what that means? GOERKE: They do. You know, but the funny thing is when my kids were younger, my eldest especially - and I just was retelling this story to someone the other day. And I guess she was about 7. And we were in a grocery store, we were wandering around. And she said, Mama, why isn't anybody talking to you? I said, what do you mean why isn't anybody talking to me? And she said, well, don't they know you're famous? GOERKE: And I just - it was adorable. And I laughed. And I said, well, sweetheart, not everybody knows about opera. And you know, she said, well, I - they should. And I said, well, I agree. 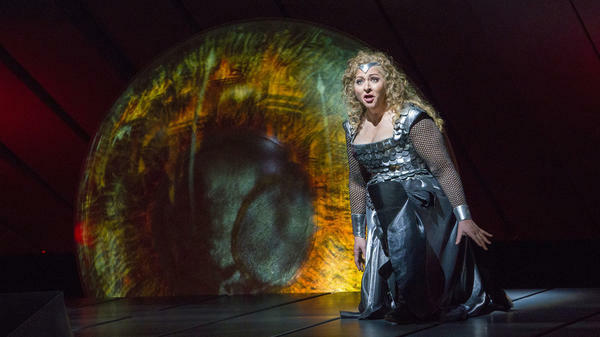 SIMON: Christine Goerke, soprano performing as Bruennhilde for the season's productions of Wagner's "Ring" cycle at the Met in New York City. Thanks so much for being with us, and good luck. GOERKE: Thank you so much for having me. I really appreciate it.